Last year we launched our festival “Composers play their own music”. After its great success and enthusiasm from the musicians and audience members alike, we decided to make it an annual event. Hereby, we are excited to announce the festival details for April 2019! The festival will take place on the 6th and 7th of April with shows at 15h and 20.15h. All performances will feature composers performing their own works both alone and with collaborating musicians. Meet & Jam: Musicians from the festival meet and jam – creating new compositions live for the audience to witness! Toets des Tijds Concerten (Keys of Times) presents a Festival of instruments from large and small clavichords, harpsichords all the way to heavy fortepianos and modern grand pianos! The program consists of compositions from Bach’s time and works written by contemporary composers. During the Festival Rosanne Philippens, Petra Somlai, Gerard van Vuuren and Kaoru Iwamura will tell about differences between the past and now days, loss of some instrument types and why the modern grand piano took over in the keyboard family of instruments since 1850. Gerard van Vuurenwas born in Surinam, he moved with his family to Holland when he was 7 years old. He started playing the piano at age nine, and studied this instrument at the Sweelinck Conservatory in Amsterdam. Realising he was getting more and more interested in Baroque music, he decided to switch instruments, and went to study harpsichord with Jacques Ogg at the Royal Conservatory in The Hague – where he graduated in 1992.Together with fellow-students he founded ‘The Beggar’s Banquet’, giving concerts in Holland, England, Germany and Poland. Rosanne has appeared as a soloist under Yannick Nézét-Sequin, Lawrence Foster, Antony Hermus, Michel Tabachnik, with orchestras including the Rotterdam Philharmonic Orchestra, the Philharmonisches Orchester Stuttgart, the Barcelona Symphony Orchestra and the Jerusalem Symphony Orchestra, and she performs regularly at the Concertgebouw Amsterdam, the Berliner Philharmoniker and other prestigious venues. In the 2017-18 season Rosanne will appear with the Dutch Radio Philharmonic Orchestra in the famous Saturday Matinee Series in the Concertgebouw, with the Amsterdam Sinfonietta, the Sinfonie Orchester Sankt Gallen, the Joensuu Chamber Orchestra, the Orchestre International de Genève and at festivals in Iceland, France, Israel, Germany and The Netherlands. For 2018-19 concerts are scheduled with the Rotterdam Philharmonic Orchestra and the Residentie Orchestra The Hague. Rosanne captures a great love for chamber music. She appears regularly with musicians suchas Nicolas Altstaedt, Vilde Frang, Julien Quentin, Torleif Thedéen, István Várdai, Víkingur Ólafsson, Guy Braunstein, Amihai Grosz and other fine musicians all over Europe and in major halls like the Concertgebouw, the Berliner Philharmoniker,Tonhalle Zürich, Laeiszhalle Hamburg. In an old Amsterdam warehouse/antique shop, Rosanne is hosting her own concert series called ‘The Amsterdam Salon’. The evening opens with a concert, played by Rosanne and her friends from all over the world, following a clear theme, while the audience listens on comfortable couches, sipping good wine. After the concert there is an artist-jam session until the early hours. Rosanne started to play violin at the age of three with Anneke Schilt and later on with the famous violin pedagogue Coosje Wijzenbeek. She continued her studies with Vera Beths at the Royal Conservatory in The Haag, and with Ulf Wallin at the Hanns Eisler Akademie in Berlin, graduating from both with the highest possible grades. 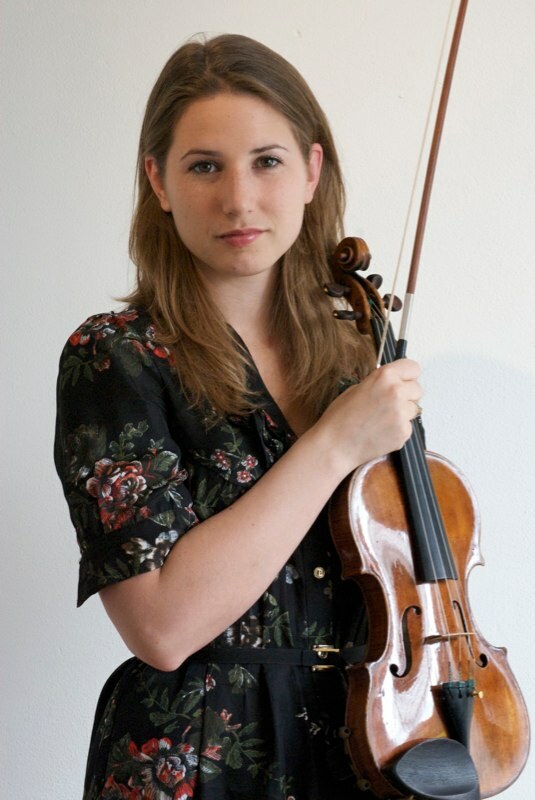 On personal recommendation of Janine Jansen, Rosanne plays the ‘Barrere’ Stradivarius from the Elise Mathilde Foundation, the violin that Janine Jansen used to play for fifteen years. Petra Somlai was born in Hungary where she graduated in conducting and piano performance at the Béla Bartók Conservatory (Budapest) and completed her modern piano degree at the Franz Liszt Academy of Music (Budapest) in 2007. She performs at major international early music festivals such as Musica Antiqua Festival – Brugge, Early Music Festival – Utrecht and many other. Petra has given concerts all over Europe, the USA, and Japan. Since 2012 she has performed often as a conducting soloist with various orchestras. Petra Somlai was a professor of Early Keyboards on the faculty of University of North Texas (USA) from 2013-2015. Currently she is professor of fortepiano at the Royal Conservatory in The Hague. Poster design by Jaela van Tijn. NovikoffMakowski sound project is a new collaboration between the young composer, performer improvisor Stanislav Makovsky and a multidisciplinary saxophone player Evgeny Novikov. Both graduates of Conservatoire de Paris, they naturally started to experiment and improvise with sounds at the live electronics studio at the Conservatoire, in early 2017. After having recorded a few sets of improvisation for saxophone and electronics, by using Ableton live, Max MSP, GRM and IRCAM tools, musicians have discovered a huge palette of sounds and possibilities for this setting: the saxophone overtones and flexibility of sound permitted to create original material for the live performances. Novikoff-Makowski played their debut concert at the Gaudeamus Music Week in Utrecht (the Netherlands) in September 2017. AIt was well received by the audience and professionals. The project is based on the prerecorded elements, that were evolved and transformed during the performances in such a way that the piece was taking a very different directions in terms of acoustics, style, sound and rhythm. As a crossover project, it observes classical contemporary saxophone techniques, free improvisation, jazz-rock, techno and more. Concert by Off<>zz, Felipe Ignacio Noriega and Anne Veinberg, featuring the CodeKlavier and special guest Robert van Heumen. Code & Klavier – the Toets des Tijds! A unique program with an array of music that’s played, coded and the combination of the two. This concert is presented by Off<>zz, Felipe Ignacio Noriega (live coding) and Anne Veinberg (piano), which is an ensemble which draws from classical music practices to morph live coding and piano performance into a ‘beyond’ classical music experience. Since March 2017, Off<>zz has been developing the CodeKlavier, a project supported by the Creative Industries Fund NL, which enables the pianist to live code through playing the piano. The concert will also feature one the Netherland’s finest live electronics performers, Robert van Heumen. In this concert, Off<>zz will perform the opening set. Starting with a solo by live coding wizard Felipe Ignacio Noriega and continued with fresh and alternative approaches to piano and live coding music creation. This will be followed by John Cage’s iconic 4’33’’ and a selection of shorter piano works by Cowell, Wolpe, Rautavaara and Collins. After the break, they will present their CodeKlavier project. Anne will first perform “hello world”, winner of the Conlon competition 2017, where the pianist live codes a toy piano sampler. This will be followed by Motippets, a work that combines musical motifs and code snippets as a means of musical programming. Finally, Off<>zz will be joined by Robert van Heumen for an action-packed set of live coding, live sampling and live piano playing that will be a feast of virtuosity on all keys.